Hearts plan to recruit at least two new players this month as head coach Ian Cathro tries to strengthen his defence. His first signing could be the Northern Ireland centre-back Aaron Hughes, who has met Hearts officials to discuss a contract until the end of the season. 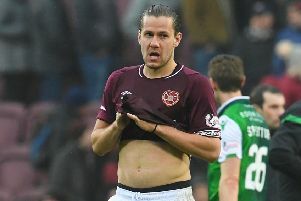 A striker could also arrive before the transfer window closes at the end of the month – but a more immediate priority is reinforcing the Tynecastle back line. Hughes, 37, is currently a free agent after leaving the Indian Super League club Kerala Blasters at the end of last year. He is wanted for his experience and leadership having played in England’s Premier League with Newcastle United, Aston Villa and Fulham. He also holds 104 caps for Northern Ireland and represented his country at Euro 2016. A short-term deal until the summer is on the table but that could potentially be extended into next season. Hughes is familiar with Hearts assistant coach Austin MacPhee, who is also second in command to Northern Ireland coach Michael O’Neill. His arrival in Gorgie would reinforce the centre of the defence and, potentially, allow Igor Rossi to fill the left-back role. Cathro, who has allowed defender Alim Ozturk to sever ties with Hearts and join Turkish second-tier side Boluspor on an 18-month deal, revealed today that he wants “a couple” of new signings initially, with anything beyond that dependent on who is available. Hearts want to secure the Aberdeen forward Niall McGinn on a pre-contract agreement ahead of next season. For now, Cathro has other targets. “It will be important that we bring in a couple of players,” he told the Evening News. “Whether that number grows from there will be down to us being able to find interesting options in the market which work for us. Striker Tony Watt has returned to parent club Charlton Athletic after his season-long loan was cut short. Spanish forward Juanma Delgado is also close to completing a permanent move to Japan. He is currently on a 12-month loan at UCAM Murcia in Spain but that will be ripped up to let him join V-Varen Nagasaki. “Everything does free up wages. Juanma is on a season-long loan as it stands so there’s no direct influence on that,” continued Cathro. Dundee United are still interested in signing another Hearts striker, Conor Sammon, but the Irishman has stated he wants to fight for his place at Tynecastle.